Imagine a vast colorful garden in the middle of the desert, that's how amazing Dubai Miracle Garden was. I have never seen such awesome garden in life not until I visited this fiction like genius attraction of Dubai. Its a place for people of all nation and age where everybody will surely enjoy so let me share my Dubai Garden experience with you all. More than 45 million blooming flowers in stunning designs, awesome shapes and structures. An eye catching color combinations achieved through 45 different flower varieties and color. Miracle Garden is one of a kind in the region and in the world for such a unique display and extravagant outdoor recreational destination. Miracle Garden has the record in Guinness Book of Records for having the longest wall of flowers which will give a new landmark for Miracle Garden and for the City of Dubai, which is believed to be the leader in diverse and cultural tourist attraction. With more than 45 million flowers this season, Miracle Garden in Dubailand now opens its door to the public. Located in Dubailand, Miracle Garden's entrance fee is Dh30 per adult while disabled and kids three years and below will allowed free of charge. It will be open all through the week 9am to 9pm on weekdays and 9am to 11pm during weekends. YAS Waterworld Abu Dhabi is the largest waterpark in the capital of United Arab Emirates. Spread over 15 hectares, the waterpark features a thrilling range of 43 rides, slides & attractions. Four rides will be one-of-a-kind rides that have never been seen in a waterpark. YAS Waterworld Abu Dhabi's theme is based on a legend that represents local Emirati culture & heritage. Visitors will be able to enjoy attractions that follow the adventures of the waterpark's main character Dana- a young Emirati girl in search of a legendary pearl that brought prosperity to her village. Building on the legend, the park will have a unique pearl diving attraction that showcases the role of pearl diving played in the UAE's rich history. This is one of the best tourist destination I will definitely recommend when you visit Abu Dhabi. YAS Waterworld is a great place to hang out & have fun with friends as they offer the some wild & out-of-this-world water rides & attractions. We rented a cabana that gives you all the needs & comfort you need from food, cooling fan, comfortable reclining chairs & even fresh fruits & refreshments at a very affordable price range. It's a ride all you can basis, so you can try all the amenities until you get tired from all the thrill & fun this theme park can offer. YAS Waterworld is divided into 9 zones for it to live the ultimate adventure. Their opening hours are from 10AM to 6PM daily. Travel time from Dubai Marina is approximately 45 minutes and approx. 30 minutes Abu Dhabi. For more informations, please go to www.yaswaterworld.com or call +971 2 414 2000. Now go out there and have an amazing adventure. Tot's Playground and Yehal Infants Pool. One of the most stunning hotel I visited in UAE is this hotel named Emirates Palace Residential Hotel. It is once the home place of the Sheik of Abu Dhabi, the capital of UAE. It is located in the heart of Abu Dhabi. This hotel amazed me with its structural design and of course the gold (literally pure gold) covering most of the hotels interior art forms & design details from the walls, chandeliers & pillars. It was here where I first saw the first Gold dispensing ATM machine, how cool was that. From inside & outside of the hotel vicinity, you will just fall in love with its natural beauty & I hope one day I can also check in myself in this amazing hotel. The Emirates Palace Presidential Hotel. Travel will never be complete without shopping. UAE is known for their extravagant shopping malls that you shouldn't miss. We were able to visit Abu Dhabi Mall & World Trade Centre Mall for a day. What else would be better than window shopping, food tripping & having coffee after a whole day of shopping therapy. We were also able to visit the SOUK Market which was the traditional market place of the Arabian culture. We were again amazed with all the must buy items from souvenirs, foodies & traditional handicrafts. So here's some of the awesome photos taken that I wanna share with everyone. Wooden architecture of Abu Dhabi Mall. Welcoming a new year will always be the most exciting part of the year where we always start making new goals, setting up dreams & start believing that something new & better will come. I guaranteed myself that this year will be my best year in terms of achieving more of my travel escapades & blog plans for 2014. So here's my January photo diary on how awesome did I start my year. So keep on reading my blog for future blog post dedicated to all of my regular blog followers out there. Shaek Zayed Grand Mosque is located in Abu Dhabi, the capital city of United Arab Emirates. It was initiated by the late president of UAE Shaek Zayed bin Sultan Al Nahyan and is considered to be the key for worship in the country. As the country's grand mosque, it is the key place to worship for Friday gathering & Eid prayers. The mosque was constructed from 1996 to 2007. It is the largest mosque in the United Arab Emirates & the eighth largest mosque in the world. The mosque size is equivalent to the size five football fields approximately. During Eid it can be visited more than 40,000 people. It was named after the founding father Sheikh Zayed bin Sultan Al Nhayan who is the first president of the UAE. Zayed had a keen interest in the history of the Arabian Peninsula. In the Arabian Desert, Zayed learned courage & chivalry. The experience that Sheikh Zayed had growing up in a harsh environment had a tremendous impact on shaping his exceptional personality. He was known for his patience, insightfulness & optimism but the central trait of his personality was wisdom. Sheik Zayed Grand Mosque was a dream in the heart of Late Sheikh Zayed bin Sultan Al-Nahyan. The Mosque is an expression of a visionary leader who believed that nothing is impossible & conceived that the most gracious achievements start from the heart. The Shaek Zayed Grand Mosque. What a great experience to spend the first night of our Dubai experience at Al Mansour Dhow Dinner Cruise by Radisson Blu Hotel in Dubai Deira Creek. From Abu Dhabi, we spent 2 hour bus ride to Dubai. From IBN Batuta Station, we went straight to our hotel in Four Points by Sheraton in Bur Dubai. We got ourselves some good rest & went straight to Dubai Deira Creek for an exciting dinner cruise. We got this awesome deal at cobone.com for only 75 dirhams ($30 SGD) or around Php 1,100 pesos. You just make online payment same with Groupon, then present your coupon, then you will be welcomed by hospitable staff aboard the majestic wooden hand crafted dhow for an amazing dinner cruise experience. The two hour cruise will let you experience the sight, sound & taste of true Arabia. 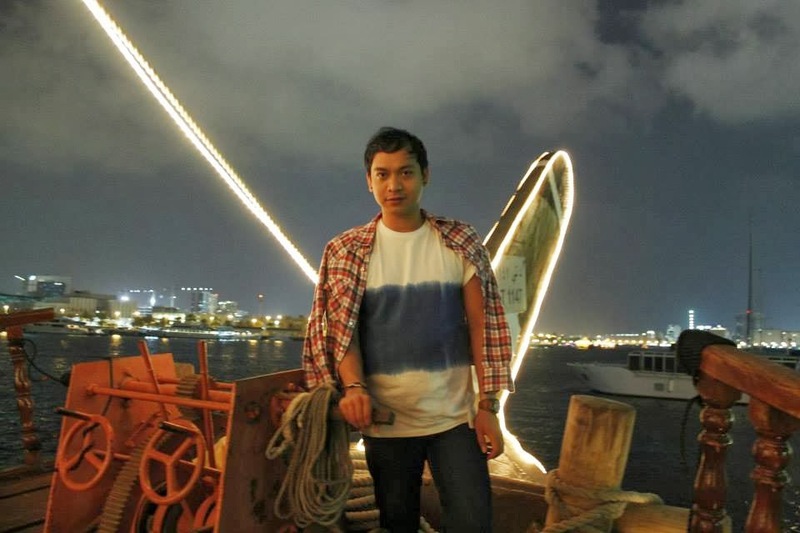 Majestic view on the open deck of our Dubai first night Dhow experience.